Meds Biotech CBD edibles are available in multiple flavors, strengths and formulations. Their CBD gummies are formulated to be pure and effective. Non-GMO, gluten free and US made. Sourced from industrial hemp, free of THC. These Pharmacist prepared edible gummies are infused with CBD from organic hemp oil. 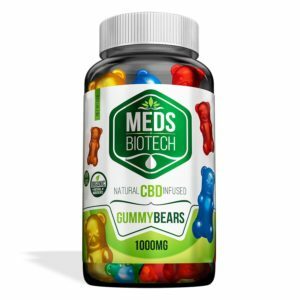 CBD Infused Gummies— A great way to get your CBD in gummy form. Bottles are available from 100mg containers up to 1500mg. Gummy Bears, Watermelon Slices, Sour Bears, Mini Fruits, Rainbow Bites, Ocean Gummies, Gummy Rings, Sour Faces, Gummy Worms and Sour Snakes.